Asking clients for their interior design “budget” wastes their time – and yours. Budget questions limit their thinking — and your income. It’s not just that most clients don’t know their budget for design. They don’t even have a clue. That’s why it makes absolutely no sense to ask clients up front what they want or expect or plan on spending for new home furnishings, a kitchen and bath remodel, etc. ASID returns to Dwell on Design in Los Angeles, May 29-31, with more than 18 can’t miss continuing education sessions featuring topics of interest to all designers, regardless of their career stage. The Society will also host Designer Is In – the popular consultation event for design-seeking consumers. We want to meet you! Please join ASID at booth #2329 for conversation, networking, and more. Dwell on Design, curated by the editors of Dwell magazine, brings together the best and brightest products, services and thought leaders in modern design for a series of exhibitions, conversations, education, and more. Don’t miss this event. See art come to life, and enjoy drinks and appetizers during the opening red carpet reception. Then move into the museum’s main courtyard for an elegant dinner and awards show. And finally, round off the night with dessert, dancing, and a tour of the art galleries. Ticket prices increases after May 30. Purchase your ticket today. 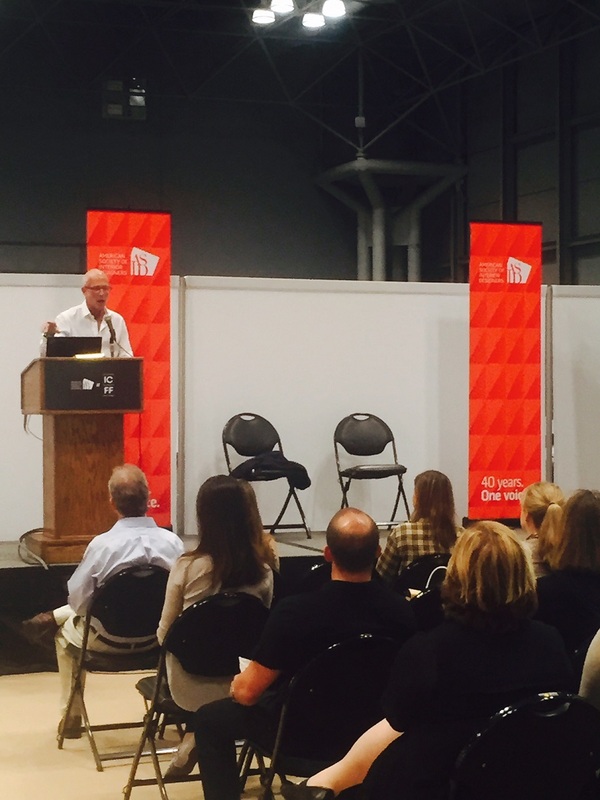 Earlier this week, ASID hosted thought leaders and industry experts who presented a wide range of educational sessions at the expanded ICFF in New York City. ASID presented 11 education sessions throughout the four-day show focusing on topics from biophilic design to licensing agreements to materials selection. ASID also hosted a bustling Career Exchange where students and young professionals received career advice and portfolio reviews from professional designers. 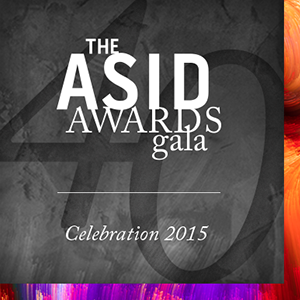 Cosentino Centers across the country will host an ASID 40th Anniversary Bash during the week of July 20, 2015 with all proceeds benefiting the ASID Foundation’s important work. All ASID Chapters are encouraged to participate and attend. A $20 donation per person is recommended for a great evening of networking opportunities, wine and hors d'oeuvres, a silent auction featuring items donated by Cosentino and local Chapter members, and much more. The Cosentino Center that raises the most money will win a hosted party for the local ASID chapter and Cosentino employees. More details and a full schedule of events will follow. The Business of Luxury Design (BOLD) Summit 2015 will take place in Palm Springs, Calif. June 24-26, 2015. The Summit will focus on increasing profits, building an efficient team, developing a strong referral network, and being recognized in the right publications. 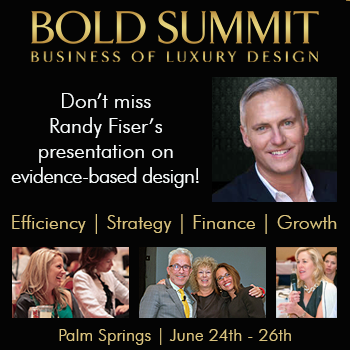 Don’t miss the presentation on evidence-based design by ASID CEO Randy Fiser at BOLD. Learn more. ASID has once again partnered with NeoCon, the largest design expo for commercial interiors. The expo will take place in Chicago June 15-17, 2015. Kick off NeoCon in style on Monday, June 15, with a luncheon sponsored by the ASID Illinois Chapter at the Miele Showroon, Suite 222. Spend time with colleagues and friends, and network with ASID national leaders, staff, and ASID members from across the country. End your day at the ASID reception hosted by Allermuir, Suite 3-123. Network with leaders from both organizations, meet designers, and reconnect with friends. On Tuesday morning, Jason Silva, host of National Geographic Channel’s series Brain Games, will deliver the keynote address, sure to be one of the can’t miss events of the expo. Tuesday afternoon, students and recent grads can participate in the ASID Student Roadmap and experience a curated tour of NeoCon with professional designers who will help newcomers navigate the trade show. On Wednesday, students and recent grads have the opportunity to meet one-on-one with design professionals for career advice or a portfolio/resume review during the popular ASID Career Exchange. Register today to celebrate design and visit the ASID community lounge at Booth #7-3012. The Nominating Committee of the ASID Foundation’s Board of Trustees is now accepting nominations for candidates to fill two open seats for three-year terms beginning October 1, 2015. The ASID REGREEN Implementation Workshop will make a stop in Honolulu on June 5. Learn to provide environmentally-respectful interiors through design, and gain key information for residential renovations and small commercial projects. The one-day workshop is based on the REGREEN Residential Remodeling Guidelines©, a set of sustainability best practices that emphasize green product selection, team integration, and whole-systems thinking. REGREEN is designed for professionals who want to create sustainable, healthy interiors through single-scope projects, and whole-house rehabs or historic preservations. Learn more and register. Learn from these design leaders and join them for a meet and greet at the Dwell Bookstore on the trade show floor. As "Mad Men" comes to an end, the Los Angeles Times asked several designers, "What shows will you watch for inspiration in the future?" Their answers may surprise you. Tasteful Building: Can Great Design Impact All Five Senses? Each of our five senses – sight, sound, touch, smell and taste – plays a key role in how we experience the world. When it comes to the design of buildings, architects are increasingly designing with all of these senses in mind. The impact of sight, sound, touch and even smell are obvious enough, but taste? Maybe thinking of our sense of taste when it comes to buildings is not so crazy. As material health and transparency have taken center stage in the sustainable design movement, evidenced by new Materials & Resources (MR) credits in LEED v4 that are awarded for using products with Health Product Declarations (HPDs), new research examines closely the relationship between the chemicals used in common products and furnishings and the occupants who come into contact with them. Increasingly, designers and specifiers are faced with critical specification decisions that must weigh the costs of factors such as safety against human health impacts. Dr. John Turpin, professor of interior design and dean of the School of Art and Design at High Point University, will serve as editor-in-chief of the Journal of Interior Design. He was appointed to a three-year term starting May 1. Pablo Picasso reminds us to continually sharpen the saw and never stop learning. In the design world there is nothing worse than an interior designer or decorator who purports to be an "expert," only to deliver the same design concept that they have used repeatedly for previous clients. They are not-so-lovingly referred to as "decorinas" by their more professional and progressive counterparts. What separates decorinas from outstanding professionals? The solid foundation of design principles AND the discipline to continually learn and update. Both are necessary. Do you get the designing part of your job mixed up with the purchasing part of your job? Many designers do, and if you do, then you know it can cost you extra hours of work, as well as lower your overall budget. If you haven’t already, consider charging a little bit of hourly time in order to get a client to buy something so you’ll be properly paid for your time. SYSTEM4 - Swiss Engineered Quality! SYSTEM4® engineered in Switzerland: Configurable with no limits, a DIY approach for fast and easy assembly and a design that will hold its promise. Our clients are in agreement and often state:“In reality it looks even much nicer than in the brochure!“. We have no objection to that statement. If your prospects are "shopping" you, they're not shafting you. They're doing you a favor. Most interior design professionals cringe at the thought of providing design ideas to prospects, only to have them take their business elsewhere. But what "shoppers" are telling you is that you're not selling them. They're sending you a message that you are not communicating your value in a way that convinces them that they should absolutely, positively buy from you. You should be thankful they're giving you a wake-up call. Most people know that energy efficiency is an important consideration when purchasing appliances or mechanical systems for the home, but they may not consider how interior design choices can also affect energy efficiency. Consider addressing these five areas to help reduce a home's carbon footprint and save even more on utility bills. Sunlight and greenery have repeatedly been proven to boost the health, well-being, and productivity of office workers, according to a new World Green Building Council (WGBC) report co-sponsored by JLL. The report reviews decades of research on workplace design and productivity, providing "overwhelming evidence" that creating an office with plentiful natural light and plants is a smart investment. The future of housing is a really big deal, perhaps the biggest individual deal there is in terms of addressing our biggest problem – climate change, aka global warming. Many believe that housing and related mobility accounts for anywhere from 40 to 70 percent of our CO2 emissions. If there were one place to focus our energies in reducing our carbon emissions, housing would be a great candidate. The high-tech home can span all manner of devices, some connected to the home network or to each other, and some just tech-enabled in a way that brings convenience to the user. As your next universal design project gets underway, sit down with your clients and talk about how technology might improve how they interact with their home. Conventional wisdom says Americans tend to move to smaller homes after the kids grow up and clear out. But that no longer seems to be the rule. A significant number of older homeowners—30 percent, according to a recent study by Merrill Lynch—are opting to buy bigger homes. It has to do with a rebounding economy, wanting more room to entertain guests and family, and having more space to spread out. Lindsey Adelman is an industrial designer best known for her elaborate chandeliers. Her fixtures, which cost anywhere from $5,000 to $165,000, are sold around the world. In today's world, hurtling at warp-speed into the future of design and pinning down a trend may seem like bottling lighting. On a micro level, the differences in workspaces—from company culture to degree of connectivity to use of tech—inevitably seem significant. But a look at the landscape of contemporary offices through a macro lens reveals certain patterns. Here, Metropolis zooms out—and back in—on four. What does theater have to do with medical simulation and how can designers help to strengthen learning by enhancing the emotional experience? The simulation space provides learning opportunities for diagnostic and procedural training by using sophisticated simulation mannequins and patient encounters simulated by actors serving as healthcare patients. Through rigorous, repetitive training of highly technical and stressful procedures, health professionals are able to perfect their expertise for better outcomes, better leadership in crisis management, and improved skills in communicating with patients in difficult situations. Resort guests are seeking a sense of place, intimate gathering spaces, and a feeling of escape. In resort and hospitality altogether, people are looking for context, a locational experience. The big trend of the last decade is a sense of place—it’s really important to millennials, who are focused on lifestyle. Today’s college student is more attuned to design than ever before. Reared on a visual diet that includes commercial influences from Apple, Target, and other design-savvy product manufacturers and retailers, they are looking for similar visual and functional experiences in the university environment.